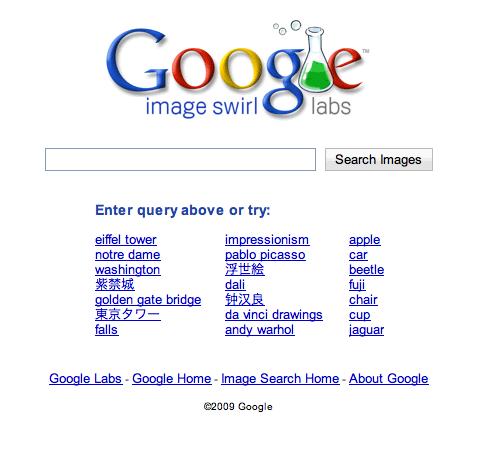 I had never heard of Google Image Swirl Labs until today when the domain showed up in my stats. Google Image Swirl organizes image search results into groups and sub-groups, based on their visual and semantic similarity and presents them in an intuitive exploratory interface. Try this tool to resolve an ambiguous query visually (apple, jaguar, beetle) or to explore a concept from different visual perspectives. Although I received a referral from Google Image Swirl, the search query inexplicably pointed to a page with no corresponding alt tag or description containing the search term. Google Image Swirl has a limited set of predetermined available images for viewing. Each Image Swirl search is auto-filled with the closet available set of images via the spelling of words as they are typed in. To see a list of potential images to view – type each letter of the alphabet in the search box – one at a time. This entry was posted on March 22, 2010 at 5:35 pm and is filed under Google Image Swirl Labs, Marketing Communications, Search Engine Marketing Firm, Search Engine Optimization, Search Engine Optimization Company, Search Engine Optimization Services. You can follow any responses to this entry through the RSS 2.0 feed. You can leave a response, or trackback from your own site.